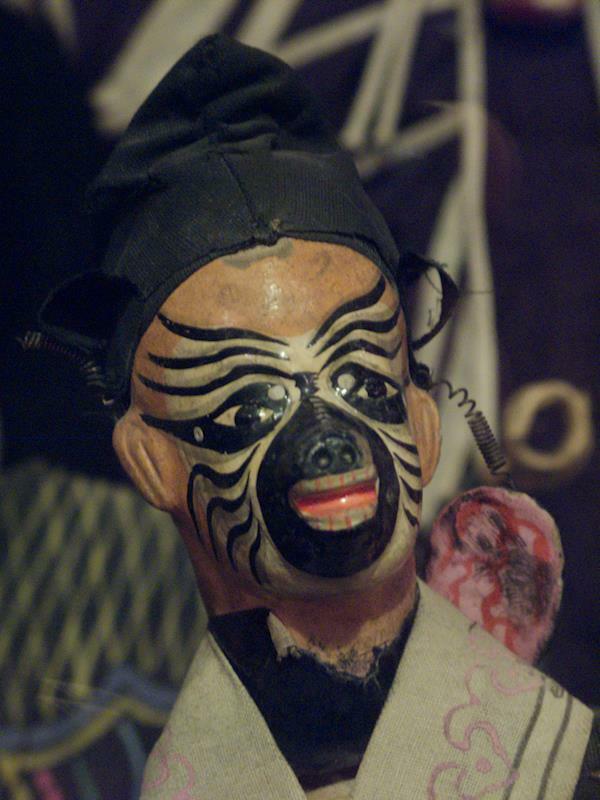 Head of a glove puppet portraying a character from The Journey to the West, China, Unknown year. Displayed in Obraztsov Puppet Museum, Moscow. The springs sticking out behind the ear is part of the headdress and have been adorned with decorations. The glove puppet itself is an artwork made as a cooperation between the head sculptur, the tailor and finally brought to life on the hand of the puppet master. 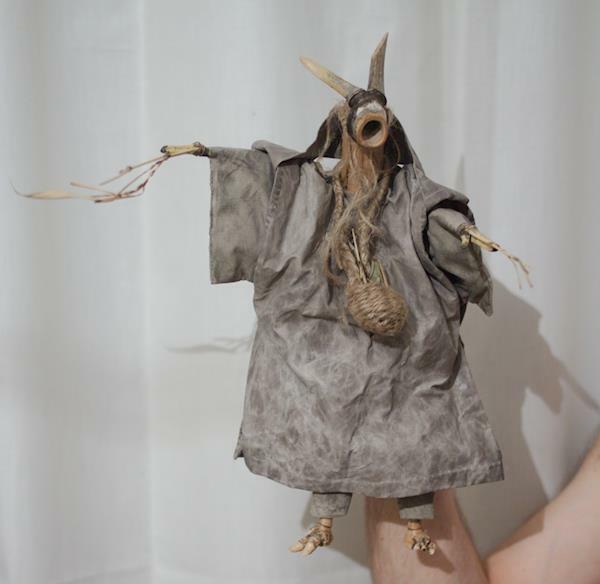 The traditional Taiwanese glove puppet is rather small, see the image below of The old mother that is the same size. The head is made out of camphor wood (even though Sorkjord uses bamboo or Swedish wood like linden). 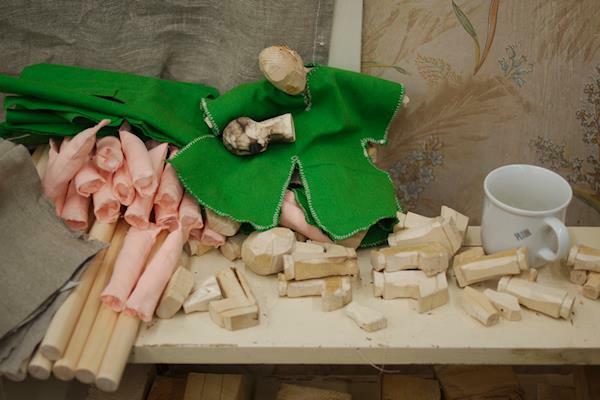 The body of the puppet consists of an inner glove and an outer glove. 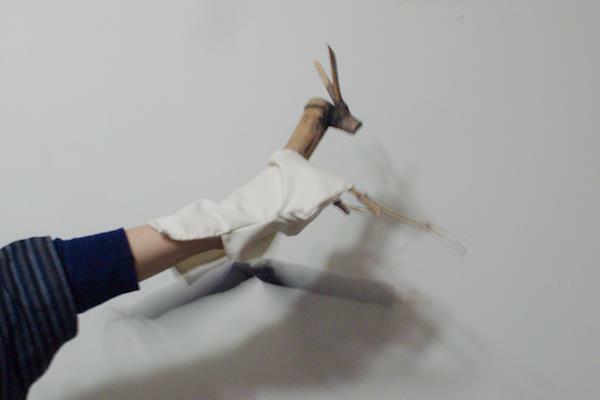 A running puppet without outer clothes, white cotton textile inner glove visible. The outer glove (see image of The old mother below), is what gives the puppet volume, while the flexible inner glove enables the puppeteer to move and turn their hand in an almost invisible fashion. The stiffer outer glove floats outside the inner glove and keeps volume and shape of the puppets' body while the puppeteer turns their hand. The Sorkfjord Glove Puppet Workshop in Killeberg, Sweden, is a full featured workshop for manufacturing of glove puppets. Heads are sculpted and clothes tailored according to the demands of the play or the wish of the client. Sorkfjord glove puppet The old mother. Bamboo and textile, 2014. Head of glove puppet finished in the workshop. Practice puppets in the making. 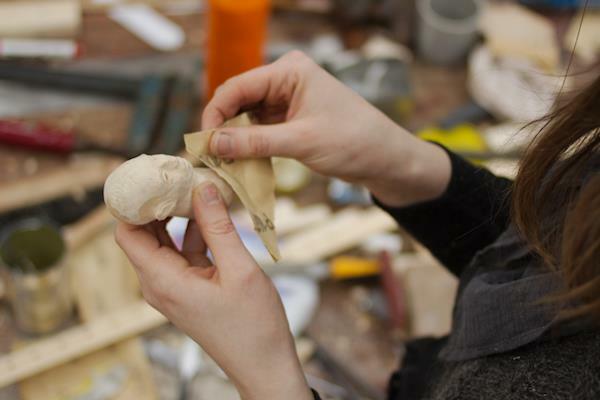 These are a simpler form of puppet, without an articulated face, that is used by students in our workshops. The puppet feels and playes like an ordinary puppet, but are very tough and can stand being dropped et cetera.